what deliciousness: May the best baker win! TO MAKE THE CREAM CHEESE FILLING: In a medium-sized bowl, beat the cream cheese and sugar together until smooth. Add the egg and beat well. Stir in the chocolate chips. Set aside. 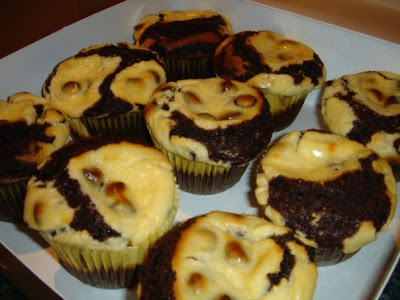 TO MAKE THE CUPCAKES: In a small bowl, combine the flour, cocoa, baking soda, and salt. Set aside. In a large bowl, on the medium speed of an electric mixer, beat together the oil and sugar. Add the dry ingredients into two parts, alternating with buttermilk and vanilla, and making sure all the ingredients are well blended. Carefully spoon the cupcake batter into the cupcake liners, filling them about two-thirds full. Drop a small scoop (about 1 1/2 tablespoons) of the cream cheese filling on top of each cupcake. Bake for about 30-35 minutes, or until a cake tester inserted in the center of the cupcake comes out clean. Cool the cupcakes in the tins for 30 minutes. Remove the tins and cool completely on a wire rack. Just went shopping and there were no muffin-sized patty pans. You could use small cupcake patty pans - any type of patty pan would work, so long as you fill them 2/3 full as it says in the recipe. I've never tried to make a full sized cake, but would love to know how that turns out! these muffins are my favourite and all the workmen loved these treats whilst working on my house. keep em coming.